Some time ago I thought about bringing the enormous userbase of Mechanical Turk along to rate questions and videos here on 101questions. We could show them your photos and videos and they would ask their questions or simply move to the next if they were bored. Consequently, we could more quickly find more perplexing photos and videos. As a test, I pulled ten photos out from our database that corresponded to the ten decile marks of the 101questions bank of photos and videos. This selection of photos represents our full range, in other words, from very boring to very perplexing. Then I showed them to 100 Mechanical Turk users and paid them to answer with a question or a skip. Here are the results. Let me graph that for you. More damning, here’s a distribution of our users and theirs. Our users ask questions at every kind of rate. 8% of our users ask questions 10% of the time, 20% of the time, etc., all the way to 100% of the time. 27% of our users ask questions less than 10% of the time and boredom-skip the rest. Then you have Turk, where the distribution is almost flipped. 40% of Turkers ask questions all the time. 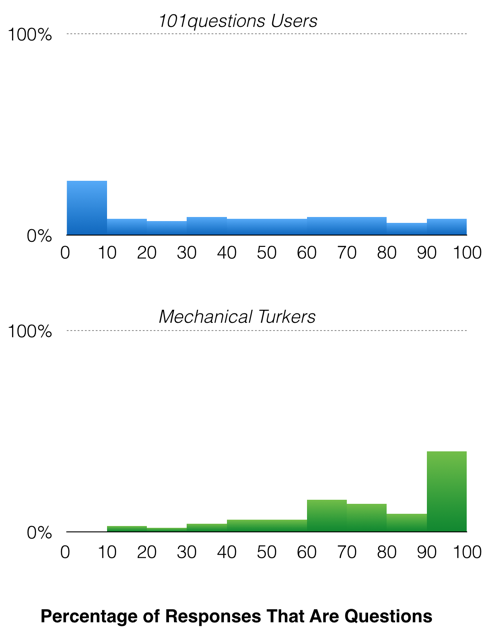 0% of Turkers skip like we do at the left end of our distribution. The modes are switched. The fact that the Turkers were paid while our users spend their own currency to be here (their time) may explain why our users are so much more discriminating. Whatever that reason, this small test has convinced me that Turkers aren’t a useful proxy for our own userbase. 2014 Mar 19. The data. I updated 101questions today to include a single major new feature: a lesson editor. Creating webpages like this soaks up too much of my time. I have to upload files in three different places. Changing a single word in the lesson means firing up an FTP client. Changing anything about an image takes ten minutes at least. None of this is creative work. So I put together the task editor I want to use. You can add supporting materials — photos, videos, questions, teacher notes, student notes, links, and more. You can re-order them quickly, all from the browser. More fun is that other users can download them quickly. Click the “Download” button and Internet pixies will zip all the resources up and send the file to your computer. I’ve been using it for a couple of weeks and I’d like you to use it also. 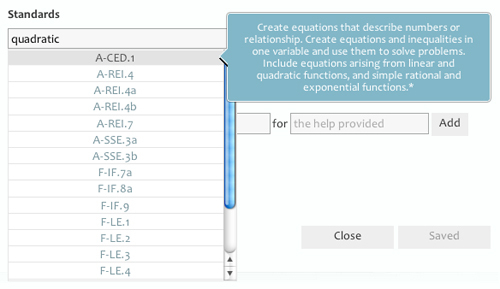 You can add tags like “pizza” or “basketball” or “money.” You can type a few key mathematical terms into the Common Core search bar and it will locate standards for you. Of course, all of this will make the search engine much smarter. People e-mail now and then telling me in kind terms how awful this spreadsheet is. I’m in total agreement. Unless you’re fluent in Common Core shorthand, it’s impossible to find tomorrow’s topic today. 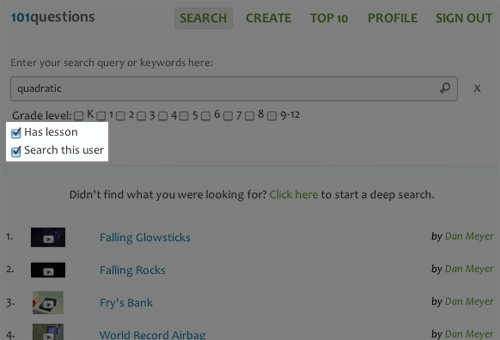 So now you can head to my page on 101questions, click Search, and then click “Search this user.” Type in what you’re looking for. 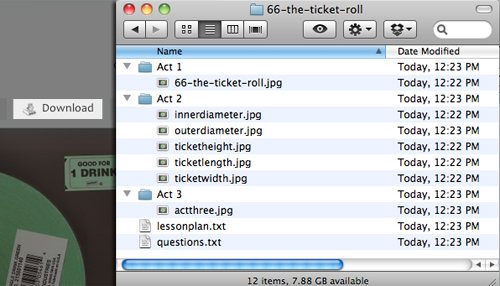 Click “Has lesson” to narrow down my material to everything that’s been a little more developed. Click the grade boxes to tighten the results down even more. Try it out. 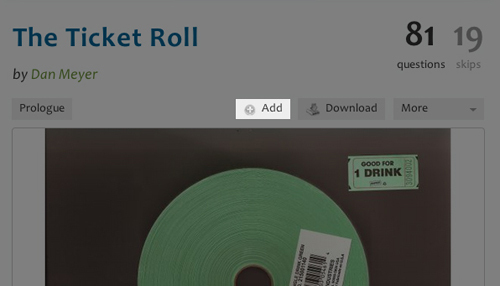 Add some tags to your old material. Leave me some comments here. I’ll need as much useful criticism as you can offer. Let’s make this great together. You have better quality control rankings. I’m no longer listing the top ten most perplexing people on the site. We can bring that list back if we miss it, but my sense from conversations on this blog and at Stanford is that it was ultimately more divisive than useful. I’ve also split the top ten lists for photos and videos and added a “right now” option alongside the “all time” rankings, so we can see what’s recently perplexing. You can bookmark questions now. Maybe your first act received eighty questions, but those eighty questions are really only composed of four or five distinct questions. You can now click a bookmark icon and put them in order from most common to least. You’ll help other people (and yourself) get a better sense of the questions people asked about your first act. Comments. You asked for comments. You got ’em. You can delete your own first acts now. Maybe someone’s comment gave you a better idea for your timelapse video of grass growing on your lawn. Now you can delete the old one before you upload the new one. You have better access to the feedback on all your first acts. I’m really happy with the new “latest” tab in your profile. It has more information — you’ll see questions and skips like before but also comments and bookmarks — in a cleaner layout. You won’t be able to upload itty-bitty images anymore. The uploader makes sure your pictures are at least the size of the viewing window. I got rid of Facebook, Twitter, and G+ sharing. No one used them and Twitter uses them to stalk you around the web. So I got rid of them and replaced them with a “Copy Link” option that puts the shortlink on your clipboard. You decide what you want to do with it. Animated GIFs are now supported. You can search the site. Something that’s a little fun is that even though you haven’t tagged your first acts in any particular way, other users have. They’re asking questions about your photos and videos and our search engine finds in those questions the semantic goodness it craves. (ie. “Everyone is asking questions about a basketball?” says our genial and dimwitted search engine. “Maybe this first act is about a basketball!”) I’ll be messing with the algorithm over time but ideally, at some point in the near future, you’ll come to the site saying to yourself, “I’d love to motivate completing the square with a video of Australian rugby” (or something equally unlikely) and the site will deliver. Add in a slew of of performance tweaks and other odds and ends and you have a site update that’s been a long time in the making. If you see anything fun or funny, don’t hesitate to let me know. Be the ‘student’ during both the staging and viewing portions. People use Google to find answers to questions. 101questions is a website that hosts a lot of questions. 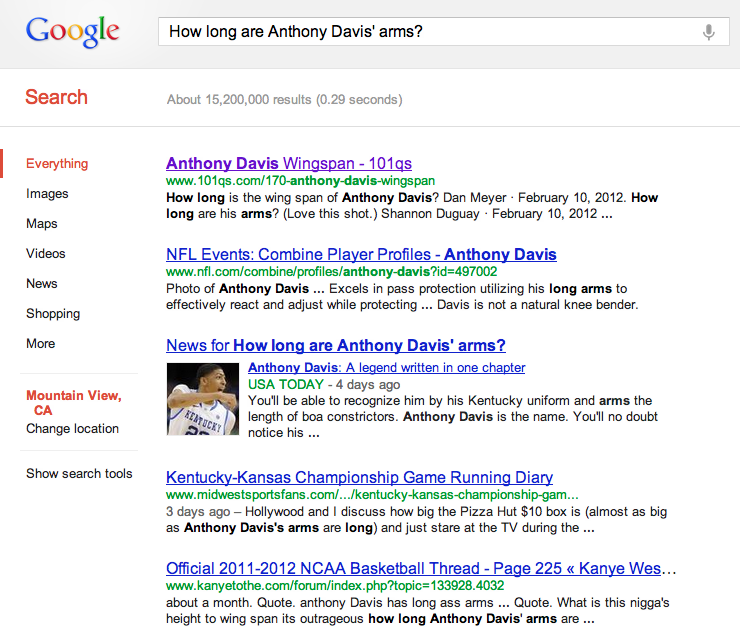 This resulted last week in a spike in traffic when a lot of people watched the NCAA men’s championship basketball game and asked Google, “How long are Anthony Davis’ arms?” a question which, as you can see from the top result of that query, we’ve been asking a lot. 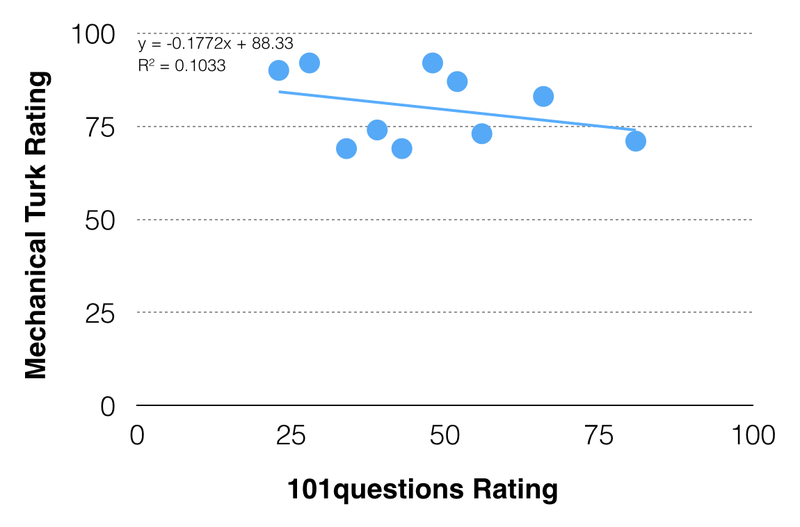 I have no other comment, except to feel sorry that 101questions doesn’t (yet) offer any answers to those questions. We set up rankings to help you locate more perplexing first acts. To make this process less mysterious, let me explain how 101questions calculates perplexity and then those rankings. Once a first act has 25 questions, it’s eligible for the top ten list, which shows you the first acts with the highest perplexity ranking. For people, your perplexity score is the average of the perplexity scores of all your first acts. If you have uploaded two first acts, one of which has a score of 50 and the other 100, your perplexity score is 75. Once you have uploaded more first acts than the median number of uploads, you’re eligible for the top ten list, which shows you the people with the highest perplexity ranking. We don’t care how well you lecture. We don’t care how well you engage us. We aren’t impressed by your fancy slide transitions or your interactive whiteboard. We care how well you perplex us. Can you perplex us? Can you show us something that’ll make us wonder a question so intensely we’ll do anything to figure out the answer, including listen to your lecture or watch your slides? Here’s one way to find out. Upload a photo or a video. Find out how many of us get bored and skip it. Find out how many of us get perplexed and ask a question. Then figure out what you’re going to do to help us answer it.